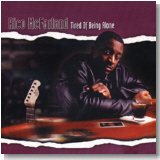 Chicago blues session wizard Rico McFarland has appeared on countless albums in a support role, but he steps out in front on his first solo release Tired Of Being Alone. It's this month's Pick Hit. Canadian guitar stalwart Shawn Kellerman puts out a top-notch independent release, Take Note. His ear-bending guitar solos highlight our September Surprise feature. We flash back this month to Vanguard's re-issue of some of the Newport Folk Festival's best blues recordings, with the album Newport Folk Festival: Best of the Blues 1959-68, featured as this month's Flashback selection. This month's What's New section features new releases from Deanna Bogart, Craig Horton, Eric Bibb, Ken Saydak, Keb' Mo', The Sidemen, C.J. Chenier, Super Chikan, and more.